People on a budget may want to consider going electric. Auto enthusiasts often like to shun people who lease their cars because doing any modifications is against the lease agreement. However, there are many "normal" people who just want the least expensive monthly car payment and leasing is a great way to have a low monthly expense (and a new car). For people on a budget, we think we may have found one of the least expensive modes of transport that can be leased today. The Fiat 500e might not be our favorite EV, but discounts have made it possibly the cheapest lease in America. 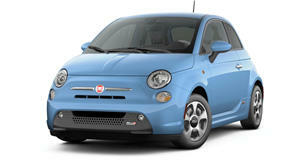 The 500e can now be leased for as little as $69 per month for a 36-month lease with no money down. The 500e is the car that Fiat was basically "forced" to build because of government regulations, and it kind of showed when we drove it. Fiat Chrysler CEO Sergio Marchionne even told consumers not to buy it because the company lost $14,000 on each one it sold. It seems like Fiat would lose even more money on this lease deal, but perhaps the company is just trying to get the car off of dealer lots. Automotive News reports that FCA did not have a role in the lease deal, which is being offered by the company's lending partner, Chrysler Capital. So how is Chrysler Capital able to lease these cars for so little? The 500e has an MSRP of $33,295, but there are lots of incentives to take advantage of. The incentives can even add up to 130 percent of the average transaction price, which was just $11,129 in February. These cars seem to be plummeting in value, and the dealers leasing them claim they will be worth $19,997 at the end of the lease. This may be optimistic because we have seen off-lease 500e models as low as around $5,500. The 500e only has an 84-mile range, which pales in comparison to new EVs like the Chevrolet Bolt, but these extreme low-cost lease deals might make it a decent option for people who have a short commute.